Under the eyes can be a tricky area! The eyes are the first part of our face that starts to age and just a 1 ml droop can age us 10 years! There are three ways we can treat under eye droop – using Platelet Rich Plasma Treatment (also known as the Vampire Facial), adding filler to under the eye or an at home maintenance programme. The Amara Signature Tear Programme is an at home maintenance and treatment programme. After a consultation with a skin health specialist, they will advise you on what programme will work best for you. 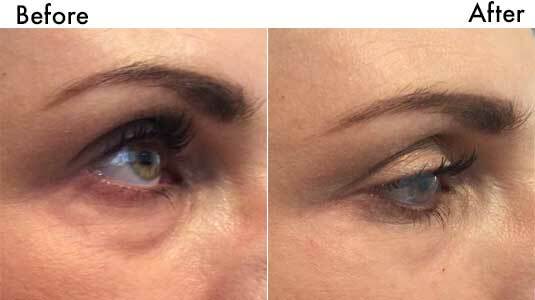 Experienced injectors can inject dermal filler directly under the eye to remove hollowness that comes with ageing, this may also remove dark circles. How much filler do I need under the eye? How much filler needed is decided at your consultation, typically 1ml of Juvederm Filler is used. How long does Filler for Tear Trough last? Like all Filler treatments at Amara we use filler from the Juvederm family which is licenced for up to 18 months. Many people like to top up after 12 months to keep that fresh look! Juvederm filler also contains a local anesthetic to minimize any possible discomfort. Our Signature tear Trough Treatment features both our doctor performed filler injection and our skin health specialist designed for home programme. Typically your treatment will start with the 6 weeks at home programme and then follow with dermal filler injection.